I find this absolutely ridiculous! MEMPHIS, Tenn. (AP) — The Memphis City Council has begun the process that could result in the removal of the body and a statue of Nathan Bedford Forrest — rebel general, slave trader and early Ku Klux Klan member — from a park. H/T FroggieLegs - The two Texas dumb asses listed, are the same ones who did the "Hands Up Don't Shoot" photo ops. 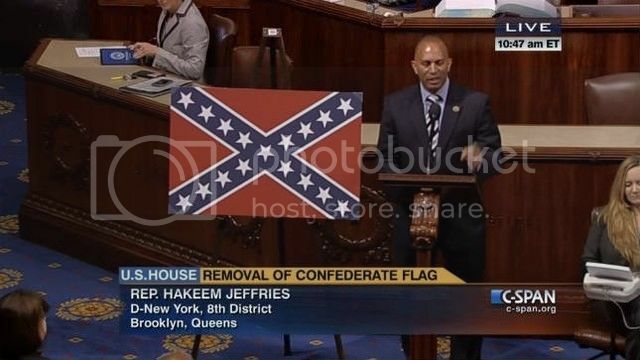 House Democrats referenced the wrong Confederate flag Thursday during a debate over the controversial symbol. A photo from floor debates shows a Confederate flag with 17 stars, according to a post on CSPAN’s Instagram account. Reps. James Clyburn (S.C.), Al Green (Texas), Keith Ellison (Minn.), David Cicilline (R.I.), Eric Swalwell (Calif.), Hakeem Jeffries (N.Y.), Sheila Jackson Lee (Texas) and Terri Sewell (Ala.) all missed the apparent mistake. 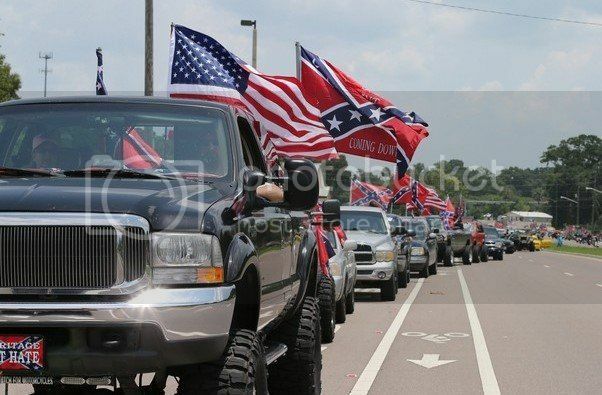 Thousands of Confederate flag supporters rallied in central Florida on Sunday afternoon. The blue-and-red-clad drivers of some 2,000 trucks, motorcycles and other vehicles flocked to the town of Ocala for a 17-mile parade in support of county officials’ decision to return the stars and bars to a site outside a Marion County government complex, The Ocala Star-Banner reported. Someone reportedly fired at least six gunshots in the direction of the so-called “Florida Southern Pride Ride,” but no one was injured, according to WFTV. Police tweaked the parade route after receiving word of threats against the demonstrators in one of the town’s neighborhoods, the Star-Banner reported. Attendees were wearing t-shirts with slogans like “Heritage not hate” as they defended the rebel symbol. A General Lee reproduction car modeled on the one from “The Dukes of Hazzard” led the ride, and most of the demonstrators were white, according to the local paper. GM gets it right about the flag, Hail to Kid Rock!! !